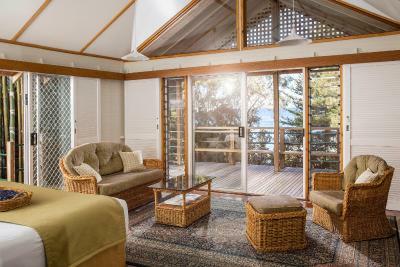 Lock in a great price for Kims Beachside Retreat – rated 9.2 by recent guests! We liked the food especially the choices for Dinner. Also your staff in the dining room were great, very easy to communicate with and very helpful. A big thank you to everyone we will be back !!!!!! Staff were extremely attentive and friendly. Grounds were immaculate and maintained regularly. Views and location were amazing. Food was awesome! Secluded tropical beach front. Luxurious. Indulgent. Delicious fine food wines and cocktails. Extensive single malt, rum and gin selections Friendly local knowledgable staff. Divine massage and reiki spa. Helen has magical hands. Friendliness and efficiency of staff, beautiful location, fabulous food. I love everything about Kim’s. Kim's is hard to fault , location great, service great, peaceful and relaxing, great place to celebrate a wedding anniversary. The bed and bedding was luxurious and comfy. The size of the room, bathroom and verandah exceeded our expectations. Our room was completely private. The range of options for dinner and breakfast meant you were spoiled for choice. 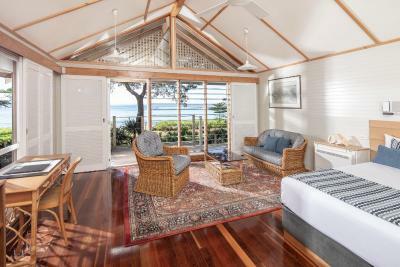 Kims Beachside Retreat This rating is a reflection of how the property compares to the industry standard when it comes to price, facilities and services available. It's based on a self-evaluation by the property. Use this rating to help choose your stay! 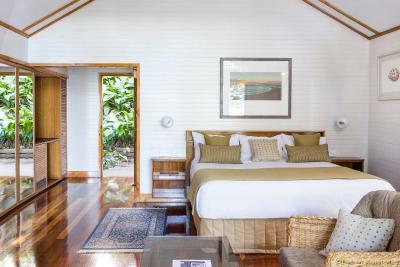 Kims Beachside Retreat offers luxury bungalows on the shores of Toowoon Bay. 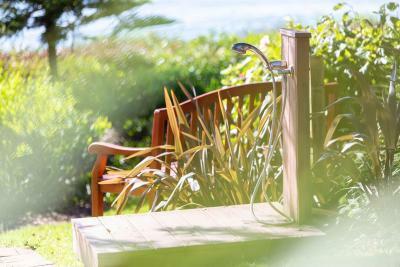 All cottages have a spa bath or hot tub, and a balcony with garden or sea views. Free Wi-Fi and all meals are included. 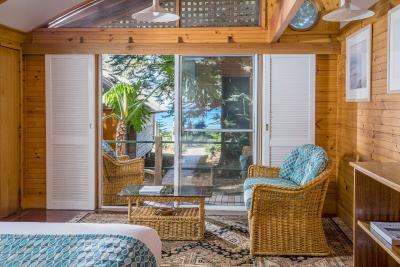 Each cottage at Kims Beachside Retreat features a lounge area with sofa, flat-screen TV with DVD player, and an iPod docking station. Air conditioning, tea/coffee making facilities and a refrigerator are provided. Guests can relax with therapeutic massage treatments. Facilities include a shared lounge area with games room, conference facilities and a guest laundry. Shelley Beach Golf Club is 0.9 mi away. When would you like to stay at Kims Beachside Retreat? Features a spa bath and outdoor seating area with garden views. Features a private patio with hot tub and garden views. Features a spa bath in the bathroom and private patio with hot tub. 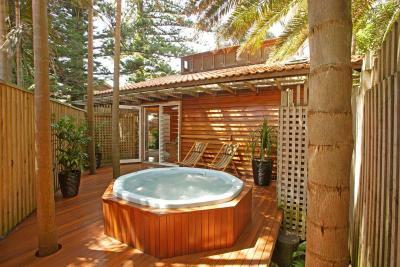 Features a private bathroom with spa bath and views of the beach. House Rules Kims Beachside Retreat takes special requests – add in the next step! Kims Beachside Retreat accepts these cards and reserves the right to temporarily hold an amount prior to arrival. Accommodation dated, drinks at bar are very expensive. I also think room upgrades should be offered as a lot of water front rooms were vacant on our stay. I can't think of a single thing! Having to leave at the end of our stay. The welcome from staff. The privacy, peace and quiet. Access to the beach and all amenities. The comfort and cleanliness of the villas. The food was truly exceptional. The wine list was both imaginative and comprehensive. The food was not value fo money for us. The location and accommodation is great though to pay $640- $880 a night inclusive of food the food should not be a buffet.It felt like we were at the local RSL only with a spectacular view. Breakfast was lovely though would be nicer to be served..Dinner was the main disappointment for us. Management should research a menu with 4 option choices for entree, main and dessert.It would then feel like value for money.There are two lots of stairs in the resturaunt which is difficult to navigate with plates of food in your hand. There should also more variety offered for wine by the glass. The location was amazing. I would definitely would stay again if the resturaunt food was not a buffet or that you could have an option with a option tariff with or without food.. The location was perfect. The food was delicious. The staff were very friendly. I honestly believe that it was too expensive for what it is. If you stray at the non water front bungalows they are dark and depressive. We luckily for a fair bit more changed it to a waterfront one.. Food was lovely and homemade, but very simple. I expected more. We loved the staff they were lovely. The water front bungalows. Closeness to the beach. The food was included. The history of the place and the beautiful pine trees. Could not find a fault with anything or anybody. The evening meal was great. The cabin was very private and comfortable. The hot tub was used a number of times.